Depending on where you travel in Central Asia, your packing list can be slightly different. For example, Turkmenistan and Uzbekistan are very hot in the summer and temperatures can get to 40°C with practically no rain. If you go to the high mountainous regions of Kyrgyzstan, Tajikistan, and Kazakhstan, it can get quite cold. So here are 20 things to keep in mind, while packing for your trip to Central Asia. 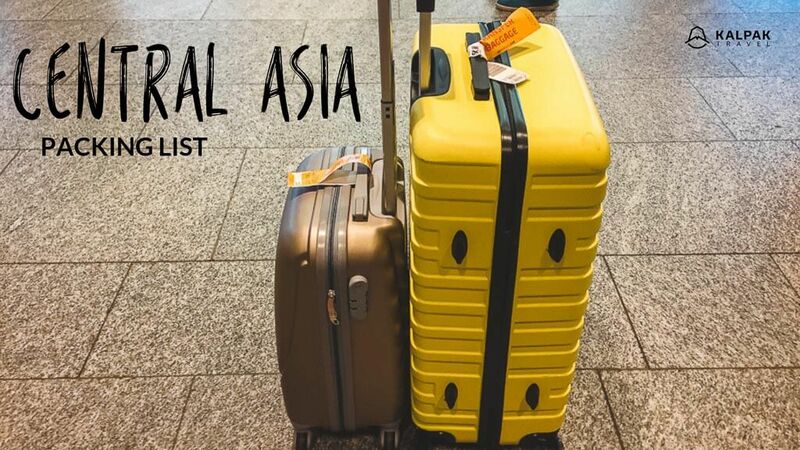 Here is a short PDF packing checklist for Central Asia that you can download and get ready for your new adventures! Before you go, make sure that your passport does not expire within 6 months from the end of your travels. Make sure that you have the right visa, for the right period of time, and a number of entries. Take your insurance, vaccinations record, and medical prescription from your doctor for needed drugs. If you plan to drive in Central Asia, do not forget to take your driving license. Make photocopies of important documents like passports, visas, tickets and insurance. Keep them separately from the original documents. Have a digital copy of your important documents on your phone and in your email box. Take enough cash for your trip and possibly even an emergency fund of US $500, but make sure to hide it separately from your main funds. Have the contact number of your bank to block your cards in case of loss or theft. USD is the best choice of currency for taking cash to Central Asia since it can be exchanged everywhere. Euros are also okay, but in Uzbekistan, you might have lower rates in comparison to the USD and it is not widely accepted (in souvenir shops for example). To keep all your money safe, we recommend using a money belt during the whole journey. Pack a full personal medical kit after consulting with your doctor. Central Asia is very photogenic so take your camera, enough memory cards, as well as batteries and chargers. Charger plugs are the same as in the EU. In many hotel rooms, there might only be one or two sockets, so taking an outlet with several sockets can be very useful, especially if you’re sharing the room. It’s always nice to share your socket with other travelers at the airports or guesthouses where sockets can be scarce. Solar chargers are ideal for wilderness hiking and camping. Travel in Central Asia involves long drives and long intercity transfers. Prepare good music, movies, and audiobooks to listen to during long car rides. The audio entertainment can be a better choice for Central Asia, rather than reading books as it is not very convenient and healthy for your eyes to read on a shaky road for several hours. Do not forget good earplugs! Take a notebook to write down your travel memories along the way. Light travel games are also fun to play with other travelers and help to shorten long trips. You will meet lots of local people and other travelers who will be interested where you come from, thus postcards can be a nice way to share your story and give a little souvenir. Always wash your hands or use hand sanitizer after using the toilet, touching pets and before eating. Hand sanitizer containing 70% alcohol kills about 90% of the germs and helps to prevent diarrhea. 8. Insect repellent and insect bite cream. You’ll be surprised at the number of mosquitos in Central Asia, so don’t forget to pack insect repellent. Insect bite cream is also very practical to pack for your trip. All Central Asian cities get very hot in the summer, so be aware of heat stroke. Take headwear and sunglasses with the best UV protection. Also, pack sunscreen with at least 30 SPF as well as a lip balm with SPF protection. summers in Central Asia are very dry and using creams and balms are recommended. Hotels generally offer laundry service, however, it can end up being expensive since it costs around 1-3 USD per item. Therefore, you might want to take compact washing powder, soap, and a washing line to hang out your clothes. If you’re going to the national parks or natural reserves, take a bio-degradable wash.
Preferably take light clothes that are easy to wash and dry. Many hostels offer cheap laundry in comparison to the hotels. A sewing kit might also be handy for repairing well-loved clothes. Uzbekistan and Turkmenistan’s climate requires light and easy clothing so pack enough t-shirts, shirts, comfortable light pants, and shorts. Hiking pants that can transform into shorts are the best as in the mountains it can be hot during the day and cool in the evenings. Dressing in layers is very practical for outdoor activities since it can get cool in the early mornings or evenings as well. Try to avoid over-packing and take high quality, comfortable clothes. In bazaars you can get a variety of cheap clothes, however, quality clothing might be more difficult to find and can be slightly more expensive than you would get at home. Take a good rain/wind/fleece jacket with you to the mountains, along with a warm sweater and good shoes. Flip flops or other rubber shoes are perfect for hot weather, swimming, and showering in hostels or guesthouses. Light trainer shoes or flats are generally good for walking in cities and for going out to eat. Good hiking shoes are essential for outdoor activities in Kazakhstan, Kyrgyzstan, and Tajikistan. Slippers are awesome to wear indoors in guesthouses, yurts, and hostels, as you need to take off shoes entering the house. Central Asia has a continental climate and generally has cold winters with hot summers. In the mountainous regions of Kyrgyzstan, Kazakhstan, and Tajikistan it can get quite cold, even in summer. In Kyrgyzstan, at altitudes higher than 4000 meters, there can be snow even in July. 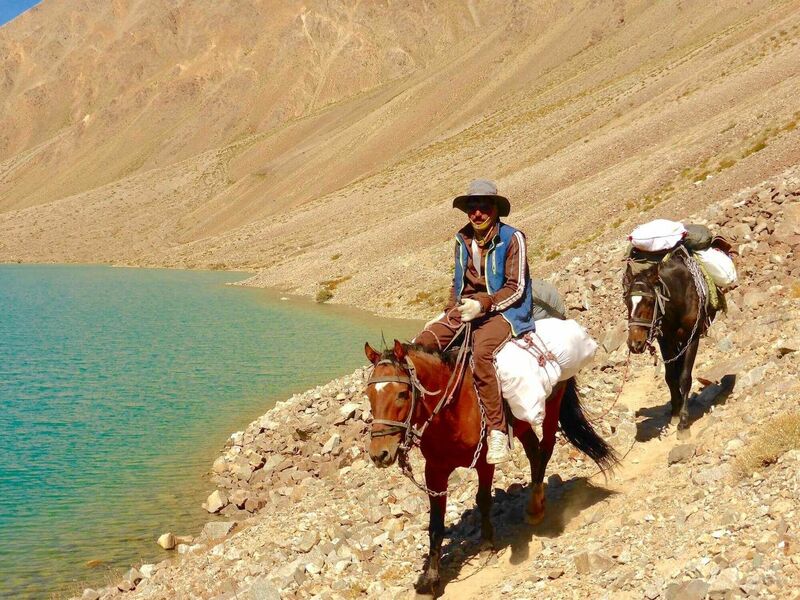 In Tajikistan it is a bit warmer at a similar altitude, however, it is still advised to pack warm things if you are going on hiking tours at a high altitude or planning to stay in the base camps of the summits. It is best to take a water/windproof jacket, and a down/fleece jacket for these hikes. Hand warmers are also practical for spending nights in tents at high altitude. In religious places, women and men are expected to cover their shoulders and legs. As you will need to take off your shoes, it is handy to have a pair of socks in your backpack. If you are heading for a hike or planning to ride in a Soviet train, pack a Swiss army knife for all occasions. In Soviet trains, there is a boiler with hot water in every wagon and it is recommended to take some snacks, tea, and noodles with you. Collapsible travel cups are ideal for jeep tours and trains. Central Asia is not a coffee drinking destination as the locals drink a lot of tea. In larger cities, you can go to coffee shops and get good coffee, for example in Kazakhstan there is a Starbucks coffee in large cities. In comparison to local food prices in cafes, coffee is expensive, for the price of one hot dish you can get one coffee. However, when you leave the cities, there is only instant soluble coffee or three in one coffee packs with extremely high amounts of sugar in it. If you cannot imagine your morning without coffee, consider taking an Italian stovetop espresso maker with you. If you plan to stay mostly in hotels and guesthouses, pack an electrical one with a plug. If you will spend more time camping, then better to take something suitable for fire. Solar flashlights and head torches are very helpful when staying in yurts (portable, round tent covered with felt and used as a dwelling by Central Asian nomads) and homestays outside cities. There can be occasional power cuts or no lights at all, therefore the solar flashlights that you can hang on your backpack during the day are perfect for the trip. In most guesthouses, and yurts you will not get a towel. There are light weight trekking towels that dry quickly and take up little space. Hanging toiletry bags are very convenient and take less time to pack when moving on the next day. Sleeping bag liners are good for sleeping at any guesthouse and yurts. Packing your own sleeping bag is the best option for outdoor trips. Another option would be just packing the pillow case and stuffing it with your jacket. Take a pajama or comfy clothes to wear at night. After long trekking and no shower in the wilderness, changing clothes for sleeping is awesome and gives warmth. Nights in yurts and trains you will be sharing with other travelers, so it is handy to have a pajama on if you will need to get up at night. Take a scarf to cover your shoulders or head when entering religious places, you can also use them as a blanket during long rides and flights. However, Central Asia is full of beautiful scarves so you might want to buy one there, especially a silk one as a souvenir from the Silk Road! Pack enough of your cosmetic products and hygiene articles. Tampons can be a hard to get an item in rural areas. Loose harem pants are perfect for all occasions while traveling in Central Asia; anything from city tours to hiking. You also might want to consider packing a long skirt, as it will cover your legs from the sun, be perfect for visiting religious architectural monuments, and will feel airy in hot summer days in Uzbekistan and Turkmenistan. Pack one dress or a short skirt for cities and nights out. Most local women living outside bigger cities dress pretty conservatively, whereas, in cities, especially Kazakhstan and Kyrgyzstan, women dress fancier. As a tourist, you can wear everywhere your normal clothes that you feel most comfortable in, not being obliged to follow local dress style. This packing list is good for travelers visiting all 5 Central Asian Countries in one tour. For travelers visiting only Uzbekistan or Turkmenistan have a look at our Uzbekistan Packing Tips.